Melbourne Cup day dawned with rain falling. Storms escalated with torrential rain through the morning. Power outages, train disruptions, flashflooding of stations and many low lying roads across the city eventuated. But the mainstream media failed to add 2 + 2 with the influence of climate change in this extreme weather event. The previous day racing officials had ordered more racetrack irrigation overnight to reduce the firmness of the track. Perhaps they should have checked the weather forecast. Intense rain events are becoming more frequent, the science is clear not only from models but also observational data. Part of the reason for this is a Warmer atmosphere that can carry more moisture. For every 1 degrees Celsius of warming the extra atmospheric carrying capacity is increased by an extra 6-7 per cent. So heavier rain. That means more flash flooding. We have constructed our urban infrastructure for 19th and 20th century climate. Our storm water and flood mitigation systems were built for the climate of the past. Hence the importance of work by Melbourne water upgrading flood retention basin dams at Jack Roper Reserve, Campbellfield Creek and Box Forest Road. City streets of Melbourne were inundated. At least 50mm of rain fell in the city in a three hour period this morning. Today's rain is 1/10th of the total rain Melbourne has had all year according to BOM meteorologist Andrew Watkins. Flemington railway station was temporarily put out of action due to flooding. Right when punters were trying to get to Flemington Race Course to watch the horse racing, including the Melbourne Cup. 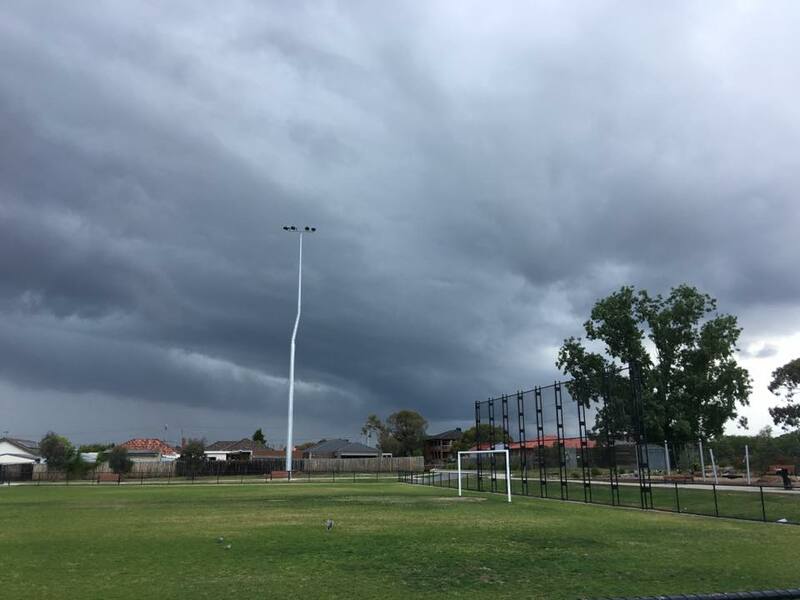 At least 30,000 homes and businesses across the city, but especially in Melbourne's west, suffered power outages due to the storms and heavy rain, according to The Age report. The SES received more than 400 calls for help on Tuesday, mostly for flood related emergencies. 9 News reported that several flights were diverted from landing at Melbourne due to the storms. TheAge carried an article Platform closed, express trains cancelled after tracks flood at Flemington, but nothing on how climate may be linked. 3AW highlighted that Flash flooding wreaks havoc around Melbourne, but nary a mention of our changing climate producing more intense storms. The ABC also highlighted Flash flooding and flashy fashions the highlights of Melbourne Cup 2018, but it too neglected the climate word. 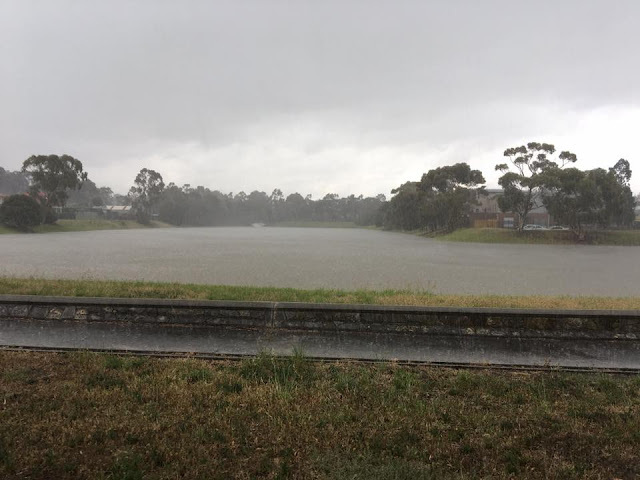 Nine News focussed on the weather angle too: Melbourne weather: Flash flooding as massive deluge hits, but also failed to make the connection between 'massive deluge' and increasing rainfall intensity associated with a warming climate. LEAN Australia pointed out the long term sea level rise risk to Flemington Racecourse. Nope, none of the mainstream stories picked up this angle, either. All our urban water systems were designed for 19th and 20th century climate events. We need to rapidly reduce emissions and also upgrade water, electricity and transport infrastructure to cope with escalating severity of climate events this century. 1. Climate change is influencing all extreme rainfall events. The warmer atmosphere holds more moisture, about 7% more than previously. This increases the risk of heavier downpours. 2. Extreme rainfall events are expected to increase in intensity in Australia. 3. For Queensland and New South Wales, the two states most badly affected by exTropical Cyclone Debbie, extreme rainfall events are likely to worsen. For example, maximum one-day rainfall is expected to increase by up to 17 and 18% for New South Wales and Queensland respectively. 4. It is critical that communities and emergency services have access to information about rainfall in a changing climate to ensure they can prepare for the future, particularly when rebuilding damaged infrastructure. As greenhouse gases increase in the atmosphere, the climate system is warming because these gases are trapping more heat. The oceans are also warming, especially at the surface, and this is driving higher evaporation rates that, in turn, increases the amount of water vapour in the atmosphere (Figure 1). A warmer atmosphere can hold more water vapour, leading in turn to more intense rainfall. 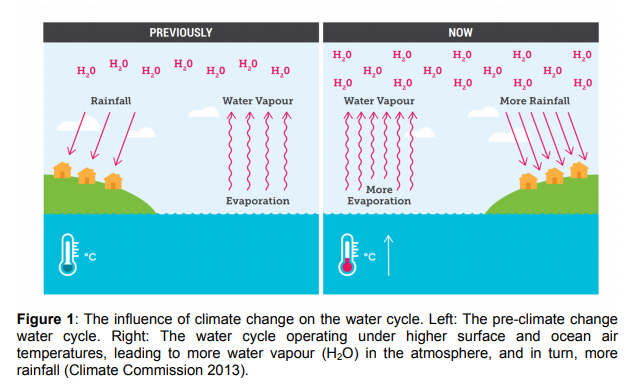 The 1°C temperature rise that has already occurred, together with increasing evaporation, has led to an increase of about 7% in the amount of water vapour in the atmosphere (Hartmann et al. 2013). This means that there is a greater risk of heavy downpours. A 2°C rise in average global temperatures could result in a 10-30% increase in extreme downpours (Bao et al. 2017). In Australia, extreme rainfall events are projected, with high confidence, to increase in intensity, where extreme events are defined as the wettest day of the year and the wettest day in 20 years (CSIRO and BoM 2015; Bao et al. 2017). The tendency for an increase in intensity may be stronger for the larger, rarer events (current 1-in-20 year events) (Rafter and Abbs 2009) particularly at the sub-daily timescale (Westra et al. 2013). A new study from the Columbia University School of Engineering and Applied Science articulates that Rising temperatures and human activity are increasing storm runoff and flash floods. We need emissions reduction stepped up at both the State and Federal Level. The state government needs to produce a climate budget to emphasise programs reducing emissions, but also climate adaptation measures to deal with the climate impacts already being felt, such as more intense rainfall producing flash flooding, and extreme heat impacts on population health. The increase in extreme rainfall events is a global climate change issue. 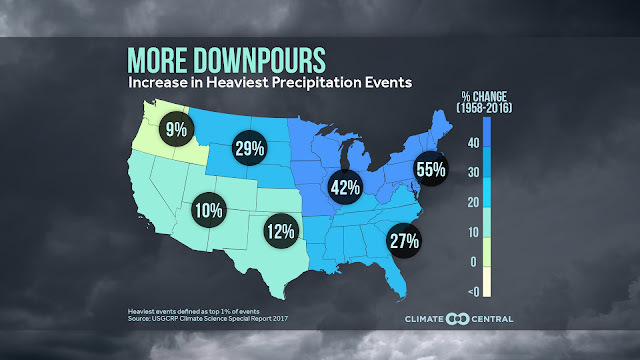 See the Climate Central analysis published April 2018 on Heavy Rainfall Trends Across the U.S. Climate Council factsheet, April 2017, Intense Rainfall and Flooding: the influence of Climate Change. Bao J, Sherwood SC, Alexander LV and Evans JP (2017) Future increases in extreme precipitation exceed observed scaling rates. Nature Climate Change, advance online publication, doi: 10.1038/nclimate3201. Columbia University School of Engineering and Applied Science. "Rising temperatures and human activity are increasing storm runoff and flash floods." ScienceDaily. ScienceDaily, 22 October 2018.